wheelnuts. it's not the most attractive word in the english language, and if applied as a nickname, hardly likely to be the most complimentary either. but in terms of its application to the bicycles of yesteryear, a particularly adept solution to affixing a pair of wheels to the frame. that is, unless you happened to be tullio campagnolo and have your fingers so frozen as you attempted to cross the croce d'aune pass (why do campagnolo not revive a that as a groupset name? so much more attractive than centaur.) that the wingnuts were beyond loosening. i doubt whether tullio thought it the finest appellation at that particular moment either, though he would have cursed the italian equivalent. 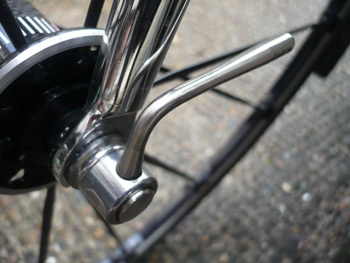 thus, assuming you are steeped in the lore of cycling's heritage, was the quick release lever born, needing only a smidgeon of grip and effort to open and drop the wheel from the dropouts. this is a process that has been vastly aided vis-a-vis the rear wheel by the almost wholesale change from road style horizontal dropouts to the vertical variation first seen on those mountain bikes that we all detest (well, we don't really, but it is unseemly to admit otherwise in polite company). despite this, i have great affection for road dropouts, though i can't for the life of me think why. 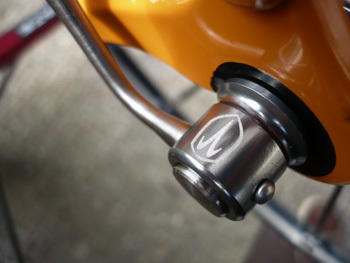 the quick release skewer has also been confounded on the majority of bicycles, even those with serious professional credentials, by what are commonly referred to as lawyer's lips; little tabs cast into the front fork dropouts to prevent the front wheel falling out if the quick release hasn't been closed properly. the latter is just one example of american litigiousness gone barmy. it's perhaps not unreasonable to expect this level of health and safety on entry to mid-level cycles, but surely anyone in the market for such as a colnago c59 would have the gumption to make sure the q/r is properly shut? 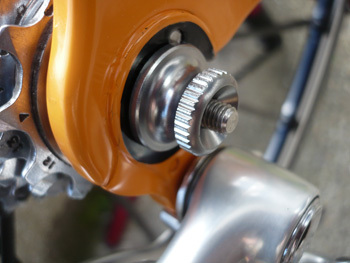 i have, in the past, queried various authorities on the enforcement of this method of turning a quick release into the equivalent of a wingnut, but there seems no consistency in its application. all of colnago's current carbon production features these fork tabs, yet the steel precisa fork on the master frames do not. and likewise the steel fork on the chris king cielo; on my particular example, there are no tabs, yet this is a frame built in portland, oregon. 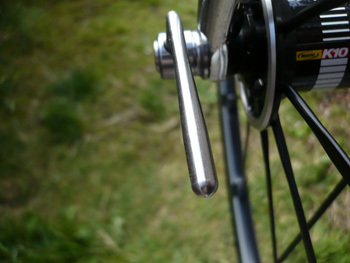 however, quick release skewers have been through many a variation since the original campagnolo version of yesteryear, but basically, all work on the same principle; a cam in the lever side pulls the skewer, clamping the forks against the wheel locknuts. it's a robust system, for i have come across several that have completed their alotted task despite those pyramidal veloute springs being totally absent. however, i have also comes across, and very recently too, a skewer that is so corroded that it is not only impossible to release the tension, but unable to be unscrewed either, resulting in another job for the junior hacksaw. the problem there is the use of steel for the skewer; aluminium is really too soft for the job. a metal easily up to the task in terms of strength as well as corrosion resistance is titanium, gaining brownie points through its more than attractive metal sheen. titanium experts, van nicholas of holland, have recently produced a rather excellent minimalist pair of titanium quick release skewers which have been holding on to a pair of mavic ksyriums (ksyria?) for the past few weeks, not only carrying out their job with remarkable efficiency, but adding considerable aesthetic appeal for shiny items of such small stature. titanium has a reputation for the occasional creak and groan while going about its business, and despite a reassuring creak as the sculpted levers are forced shut, the van nicholas skewers have remained completely silent under duress. and were good looks not enough, a pair of these will barely move the marker on a set of kitchen scales, weighing a scant 64 grams (not much more than two ounces in old money) for only around £35, likely one of the best, low cost upgrades that could be applied to anyone's bicycle. purchasing can be effected online via the van nicholas website, and i'd respectfully suggest that you stop whatever it is you're doing (silly me. you're reading this aren't you?) and order a pair before you forget, then we can all be safe and stylish at the same time.